Carries – Why Your Workouts Should Include Carrying Heavy [email protected]%! Carry heavy things – We do it often enough in real life yet we seem to avoid doing it in the gym. We like to say we are doing functional exercises in the gym yet we avoid the most functional of all exercises – HEAVY CARRIES. All carry variations work your entire body. They can work your grip. They can increase your back strength, your core strength, your glute strength. They work large major muscle groups to help you get stronger and burn more calories. Plus doing heavy carries can make your body strong in a way that helps you prevent and avoid injury. So stop avoiding a great full body FUNCTIONAL exercise and start doing Carries. 1. Farmer’s Walk – The farmer’s walk is a great way to develop full body strength while also strengthening your core. 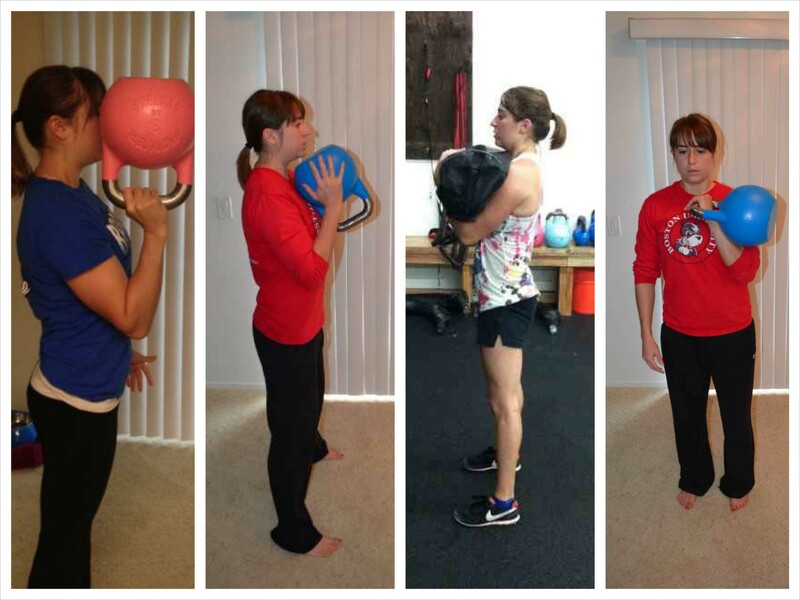 Hold heavy kettlebells, dumbbells, barbells, sandbags in each hand. Do not let them rest on your legs. Hold them just off your thighs. Keep your chest pressed out and your shoulders down and back. Do not let your back round and keep your shoulders wide. Walk around for the allotted amount of time or distance, maintaining perfect posture. You want to use weights that challenge you and make you want to drop them just before the time is out. Do not let your head jut forward or your shoulders round. Do not let the weights rest on your legs. Keep your core tight and glutes engaged as you walk with your shoulders down and back and your head up. The farmer’s walk can be done bilaterally (described above), unilaterally or with an asymmetrical weight. See those carries below for details. 2. Overhead Carry – A great core and shoulder stability move. You can do an overhead carry with kettlebells, dumbbells or sandbags. 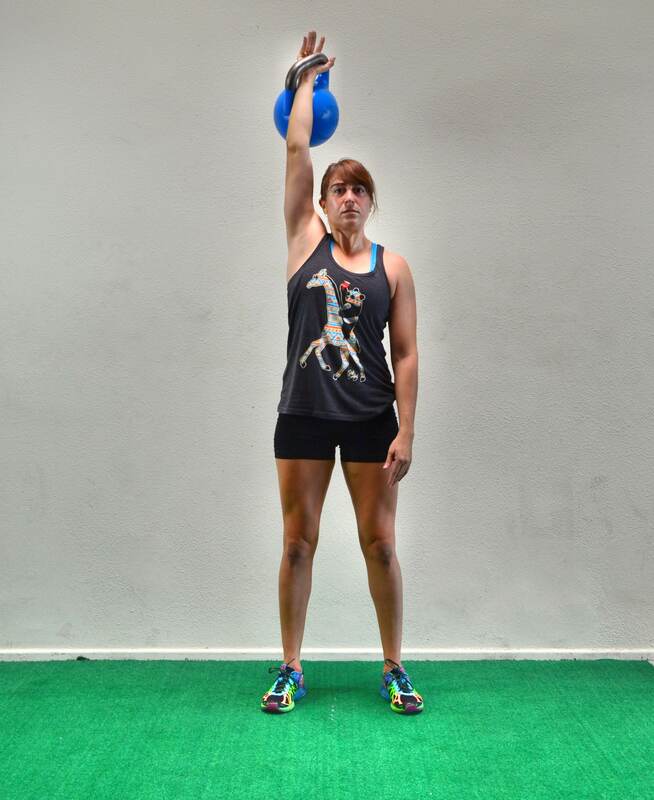 To do a unilateral overhead carry, take one kettlebell and place your hand through the handle. Rest the kettlebell on the back of your forearm. Press your hand up toward the ceiling, straightening your arm up by your ear. Do not arch your low back or let your elbow bend. Keep your core tight and your arm up straight toward the ceiling with your bicep by your ear. Do not lean to either side or shrug your shoulders. Walk for the allotted distance or time, holding the kettlebell still overhead and then switch the bell to the other hand. Make sure you keep the arm straight overhead and that you don’t feel it in your low back. If you can’t keep the arm straight up or feel it in your low back, a bottoms up carry may be a better option to work your core and shoulder. 3. Racked Carry – A great core exercise and a way to work on engaging your lats. To do a unilateral racked carry, place your hand through the handle of the kettlebell and let the weight rest on the back of your forearm. Bring your arm in toward your chest. Your hand should be right at your sternum. Your forearm should be right against your chest with your elbow flaring out just a little to the side. Do not let your hand fall out toward your shoulder. 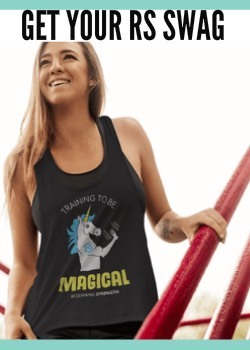 Also do not let your elbow flare up as high as your shoulder. Keeping the kettlebell in that racked position, stand up nice and tall. You want to keep your core engaged and your shoulders wide. Squeeze your belly button in toward your spine and engage your glutes. Do not lean back or to either side. Fight the desire to lean as you walk so you don’t stress your low back. 4. 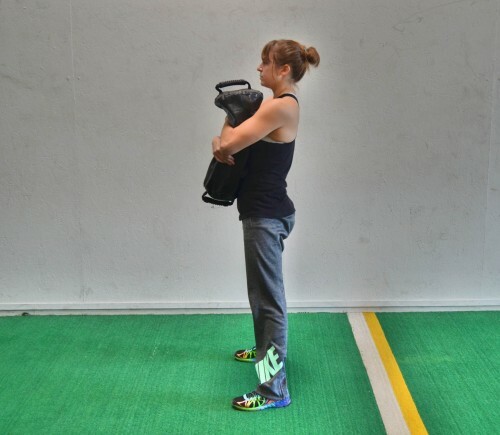 Goblet Carry – This is a great way to regress the racked carry if you struggle to balance the weights and keep your core engaged. You can use dumbbells or kettlebells for this move. 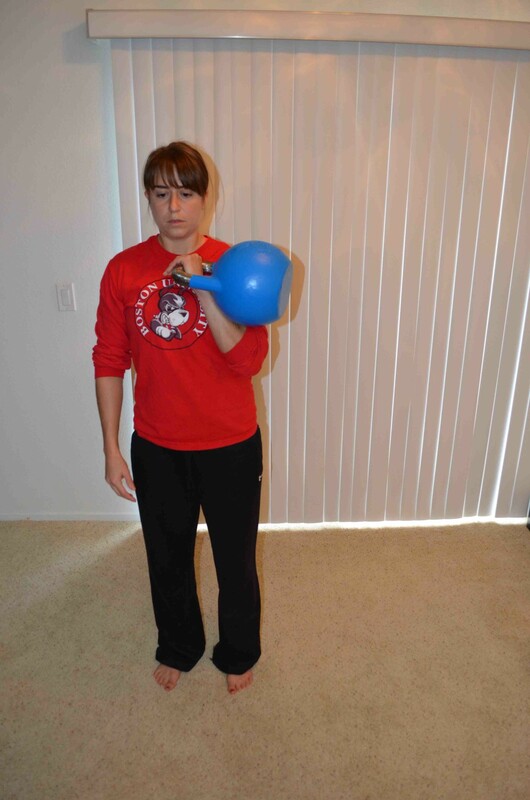 If using a kettlebell, turn it upside down and hold it by the bell portion. Keep the bell close to your chest and your elbows in by your body, pointing straight down toward the ground. Engage your abs and keep your chest up nice and tall. Do not round your back or lean back as you walk. 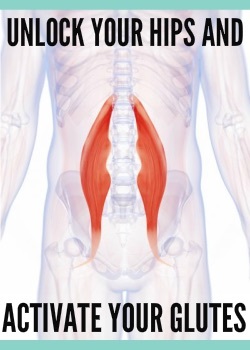 Engage your glutes and abs to protect your low back. 5. Bottoms Up Carry – The bottoms up carry is a great way to create the mobility and stability to do overhead carries while working on your grip strength. 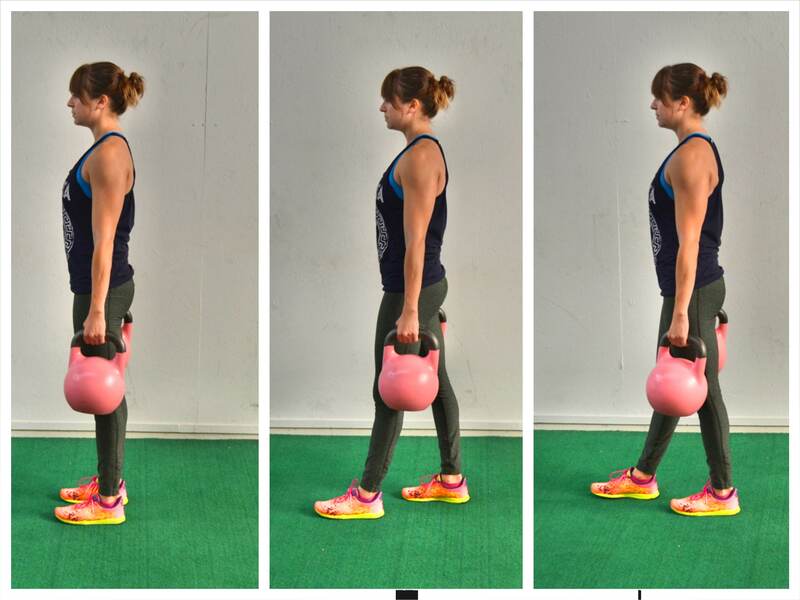 To do the bottoms up carry, hold a kettlebell by the handle upside down (so bottom of the bell up toward the ceiling). Holding the kettlebell upside down, keep your arm bent in close to your body with the kettlebell just out in front of you. Lock down your lat and don’t shrug your shoulders. 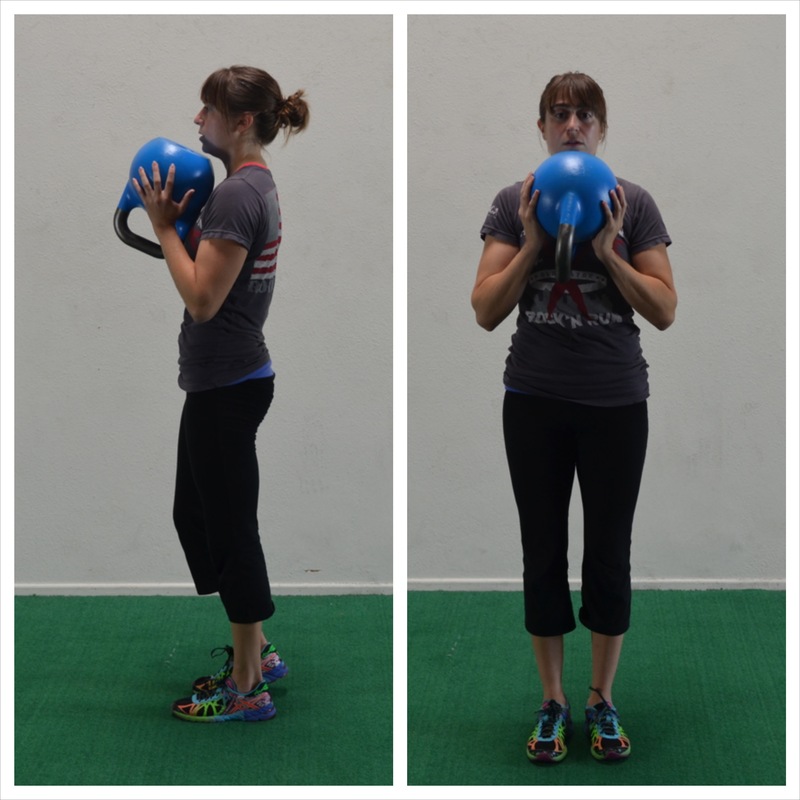 Keep a nice tall posture and grip the kettlebell hard. Do not hold the kettlebell way out in front of you or right beside your face. You want to make sure your chest is pressed out and you don’t feel your shoulder straining. You can do this as a bilateral or unilateral carry. 6. Zercher Carry – The zercher carry can be done with a sandbag, slosh pipe or barbell. It is similar to the goblet carry and a great way to work the core. To do the zercher carry with a sandbag, hold the sandbag horizontally in the crook of your elbows. Keep your elbows up so that the sandbag is up at your chest. Do not lean back as you walk. Keep your core and glutes engaged. If you use an awkward, unbalanced weight (like a slosh pipe), it will force your core to work harder to stabilize. 7. Bear Hug Carry – The bear hug carry is a great way to work your core and force it to engage. Turn the sandbag the long way and hug it in the middle, squeezing it tight in toward your chest. When you wrap your arms around it, do not interlock your hands. Just hug the bag in tight. Keep your shoulders wide and engage your abs and glutes. Do not lean back as you walk. Stay up nice and tall. 8. Bilateral Carry – A two-sided carry. Any carry like the farmer’s walk or overhead carry can be done bilaterally or unilaterally. Bilateral carries are great to work on full body strength and balance. 9. Unilateral Carry – A one-sided carry. Unilateral carries are a great way to make each half of your body work individually so that your dominant side can’t take over. Unilateral carries also force your core to work harder to FIGHT rotation, which is great to help you prevent injury in every day life. 10. 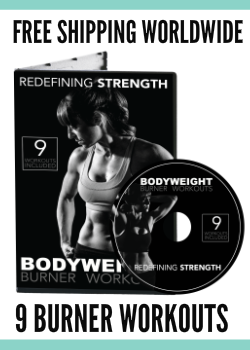 Asymmetrical Weight Carry – Carrying different weights on each side forces your body to have to fight to stabilize from leaning toward or away from the heavier weight. 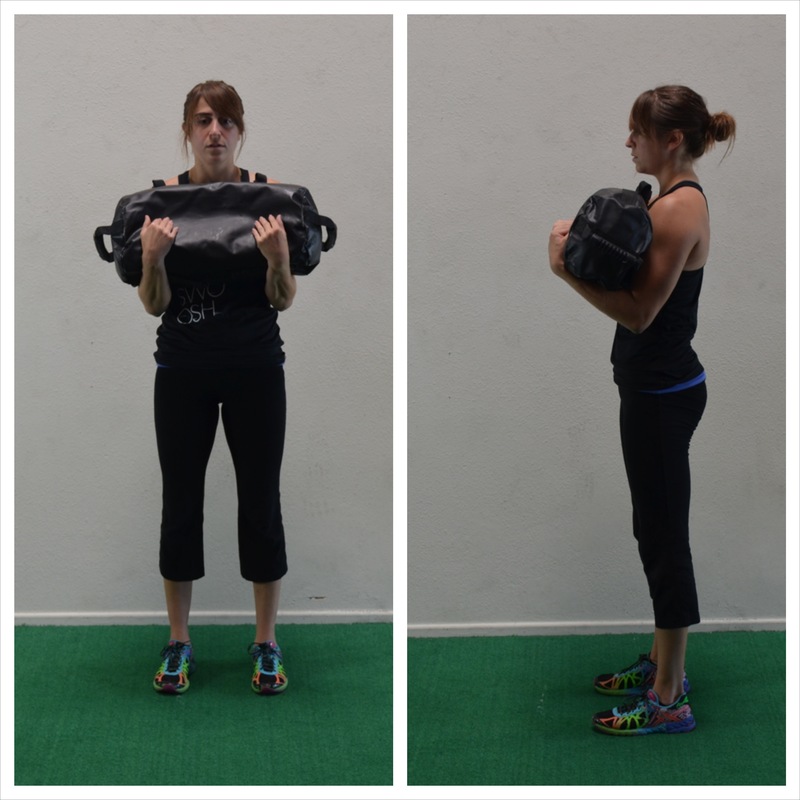 Any carry like the racked carry or overhead carry can be done with two different weights. Work your core and strengthen your entire body with these carries. And an added bonus of these moves is that they force you to have proper posture after sitting all day hunched over a computer screen. HOWEVER, make sure you engage your abs to protect your low back with all of these moves! If you want to lift more and prevent injury, carry around some heavy s$#%!